The user’s manual says my Moto Guzzi California air filter should be checked every 3,000 miles (5,000 km) and changed every 6,000 miles (10,000 km). It also advises to “apply to a Moto Guzzi dealer”, or in other words, take it to your dealer to have the air filter changed. 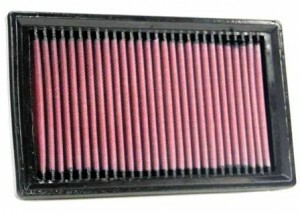 So, I did change the air filter in my ’07 California Vintage myself. In this article, I show how I did it. It wasn’t all that difficult as you will see. Now I’m curious what it will be like to work on the future California 1400? Here is the step-by-step procedure as I did it when I changed my air filter. This is not intended to be the perfect or best way, its just the way that I did it. Of course, a Moto Guzzi dealer is the preferred way to go. I am lucky because I have one near me, but like a lot of motorcycle owners, I prefer to perform some of the routine maintenance myself, like doing an oil change. It helps me know the bike better. Step 1: After riding in the “low-fuel” range to empty most of the tank, and after the bike is cold, remove the seat. 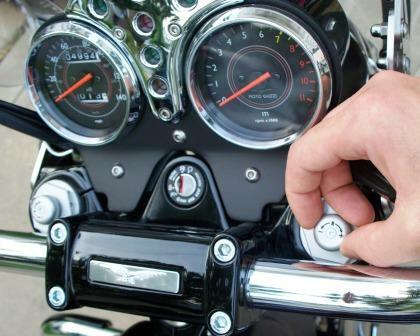 Put the ignition key in the seat lock located on the left side of the bike near the 12 VDC power outlet. The key can not turn hardly at all, but you may hear it click as it releases the seat lock. Lift the seat from the rear and tilt it upward towards the handlebars and it should lift right off. If not, maybe the lock did not release it, so try the key again and be careful not to break the key trying to rotate it. Step 2: Using a hex wrench, remove the single button head cap screw that fastens the rear of the fuel tank to the chassis. It is located between the tool tray and the tank and is right in front of you if you have the seat off. Step 3: Remove the covers that are on each side of the bike located just in front of the fuel tank. These were chrome on some California models, such as the EV, but are flat black on the California Vintage. I’ve often considered replacing mine with chrome ones, but am still on the fence about doing that. Each cover has two button head cap screws with large washers. 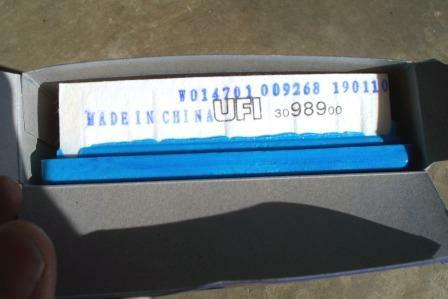 You will need a smaller hex wrench for these. The screw located closest to the steering damper is hard to get to. I noticed that the newer Vintages have different steering damper and am not sure if the screw is still accessible without remove the damper those. 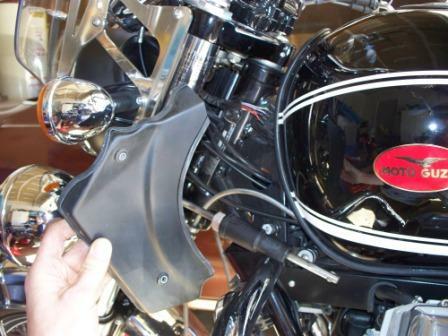 You will need to turn the handlebar to fish out the cover on each side, but it is not hard to do. Step 4: Lift the fuel tank up so that the front can sit on the center pivot bolt at the steering head. The front of the tank easily pivots and is not held by screws. It sits in some sort of rubber piece on both sides that I could not really see very well. There is a rubber strip edge guard on the tank that protects it when you do this. 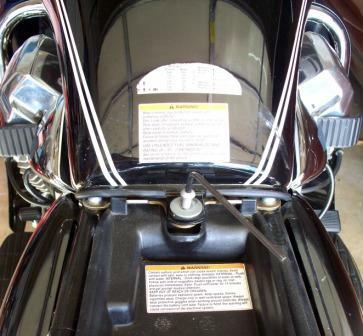 Tilt the rear of the tank up while the front rests on the steering head bolt. You won’t be able to lift it really far without disconnecting fuel lines and other stuff under there, but the good news is that you can lift it far enough with one hand while using your other hand to put a hex wrench on the front center screw of the air filter box to remove that screw. Step 5: Remove all 3 screws that hold the air filter box cover on. Hopefully you already removed the front screw in step 4. Now you just need to remove the two rear screws. After the screws are out, and while you do your one-handed balancing act with the fuel tank, you should be able to lift and pull out the filter cover with the filter still inside it. It will take a little wiggling, but it came right out on mine. Once it is out, you can set the tank back down on the bike. Step 6: So, here you are with the air box cover and filter. Remove the filter and take a good look at it. Mine had a few small bugs and some fine dust/dirt, but not much else. Overall, it was in good shape, but remember that a lot of dust and pollen is too small to see, so change it anyway as the miles dictate. Before inserting the new filter, I wiped the entire air box cover clean, and then wiped inside of the lower air box as much as I could reach. I got some brownish-looking grease that had a little black dirt on it, but barely anything at all. Step 7: Next, with the filter in the air box cover (it may want to fall out, so hold it carefully to keep it in place), put the air box cover with filter back under the fuel tank and onto the air box. This was more difficult than I thought it would be. It took me a few tries, but I finally got it. I was careful that the inlet “horns” on the air box were placed under the tank in such a way that the hoses and cables were not tangled or pinched. That is not easy to do, but I mention it so that you if you try this, you will take care not to pinch anything under there either. Step 8: Tighten down all three screws that hold the air box cover on. Make sure it closes properly when tightening those. Mine took a couple tries because I kept seeing the blue rubber portion of the filter on the left side of the bike, indicating that the cover and filter were not on correctly. Step 9: Position the fuel tank back to where it belongs and align the screw hole at the rear of the tank. Insert the screw with washer and tighten it down with a hex wrench. Step 10: Re-install the left and right side covers that go in front of the fuel tank. The one on the left side takes a little more fussing because of the steering damper. Just be careful not to lose the steel bushings that go in the screw holes on these side covers. I dropped a few, but found them and got them back in their rubberized holes with ease before I inserted the two screws on each cover and tightened them down. After re-installing the seat, you are all done. 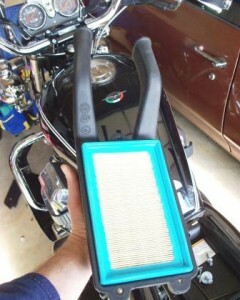 So, that was how I changed my air filter on my Moto Guzzi California Vintage. I hope this helps you next time you need to change yours, and if nothing else, I hope seeing this helps you make your decision whether or not to try to do this yourself next time on your Cali. One small regret I have is that I wish I had bought a K+N air filter instead of another UFI filter. 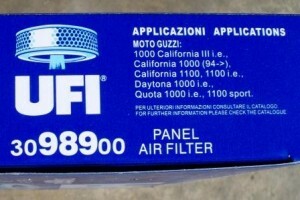 Not that anything is wrong with the UFI filter, in fact, it’s the original equipment filter that Guzzi uses. I’d like the K+N better because it would last me a lifetime of riding and is a more high-performance filter. 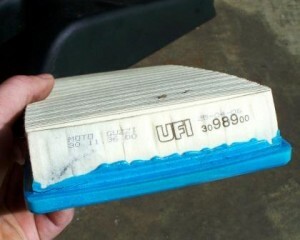 The correct K+N air filter part number for a Moto Guzzi California is CG-9002 (for model years 1995 an up). It costs around $50 normally ships within 24 hours at BikeBandit. 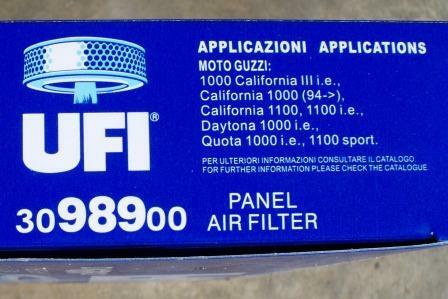 Their database doesn’t list all California model years, but search for part number CG-9002 as that crosses-over to Moto Guzzi part number 30113600 (UFI part number 3098900). To clarify, I’m not saying that something is wrong if you would rather have the the dealer to do it for you. My point is that something is wrong if changing an air filter is so complicated that a dealer must do it. Changing the Guzzi California’s air filter was a little more difficult than some folks might be used to. 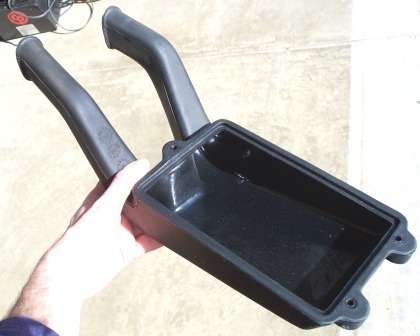 I suppose anyone could pinch a fuel line, or accidentally disconnect something under the tank, or mess up the routing of the cables and hose if they are not careful about things when re-assembling the airbox cover. I’m a mechanical engineer, but am NOT a professional motorcycle technician. Seriously, bring your bike to a Moto Guzzi dealer if in doubt. Moto Guzzi California suspension adjustment is pretty easy to do, as I hope you were able to see from this article. Adjusting suspension on your motorcycle is pretty much performed via trial and error. Remember to adjust a little at a time, ride safely, and give yourself enough time to experiment with different settings to see which ones work best for you. After considering a variety of batteries for my Moto Guzzi California, I settled on a stock AGM equivalent replacement battery from WPS Here I explain how I installed it. what might have happened is: the K&N permit more air through, and this doesn’t fit the map used by the injection system, causing the bike to run too lean. this might even out, if the “learn blocks” in the calibration permit enough deviation from the factory settings for the fuel injection to recalibrate itself using the oxygen sensor, if youve got one. thats why Harley says “injection need recalibrating”. 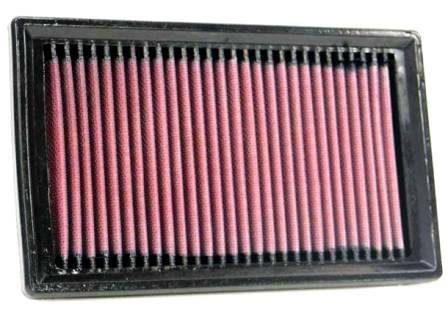 poor running after the initial install of a K&N air filter is not uncommon, especially if you over oil the unit. Take the bike out for a good flog to get the excess oil sucked out of the filter and burned up thru the motor, and your bike will be back to running fine. There are other reasons why I don’t like to use K&Ns, like the holes they develop over time that let unfiltered air through, but that is another story. Thanks for all the great tips and insights. Today I am on the Washingston State Olympic peninsula to do a 500 mile loop. Prior to this run I wanted to change the CalVin air filter. I bought a K&N for a premium price and installed it two days ago. The bike immediately had trouble idling and stumbled terribly at 2K RPM. So I assumed improper install, tore it down and reinstalled. So I did it again. I am persistent. Then I assumed it was a bad tank of gas after the filter change as I had dried it up prior to the install. So I siphoned the tank and refilled. No good. So I pulled the plugs to see if they were the culprit. Perfect. But for 5 bucks I went ahead and replaced them. So I fished the old filter out of the recycle bin and reinstalled it. IMMEDIATELY all problems solved. Runs like a sewing machine. At around 9,000 miles my fuel line came off of the fuel pump on a road trip. Luckily for me I was able to contact Ace in St. Joe Missouri. He knew exactly what had happened(I didn’t) and drove 200+ miles to get me. 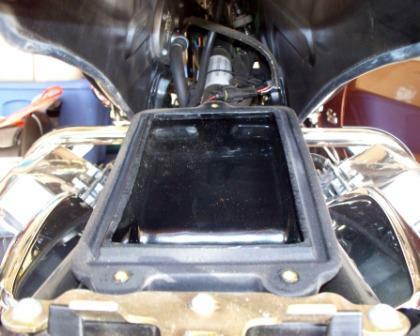 At his shop we took the gas tank off and since we had the airbox exposed Ace suggested “tricking it out” with a KNN. He sawed off the snorkels and used a hole saw to let in more air to the box with 3 or 4 strategically placed holes. He also rerouted the fuel filter for easier access and replaced the “melted- by-gasohol” fuel line with submersible fuel hose. I immediately noticed improved mid-range with a nice induction sound (kind of like a 4-barrel kicking in) when I opened up the throttle. I have since replaced the catalytic converter (we can still do these things in Wyoming) with a Euro-spec cross-over I got from Ace and that beautiful Guzzi sound and mid-range got even sweeter (without being much louder) and no reprogramming was necessary. Call Ace Cycle in St Joseph Mo. He’ll hook you up. You do not have to take the tank off to accomplish this, I just installed a K&N on my Cal Vin, Don’t disparage if the cover just doesn’t fall into place as the gasket on the K&N is slightly thicker but will compress when all the bolts are in place. Thanks for the write up, It gave me the inspiration to do this after having the filter for the past month or so.